Snippets of Jack: "You Had It Easy, Boy"
"You Had It Easy, Boy"
When Will first arrives on Flying Dutchman in The Pirates of the Caribbean: Dead Man's Chest, all the other crew members seem creepy, odd, and evil too him, not to mention the captain is just down right cruel (which is a matter of perspective;). But there is more to it than that for one particular crew member. We learned a bit about Will's father, William Turner Sr. or better known as Bootstrap Bill, back in the first movie when will discovers that he was the son of a pirate. 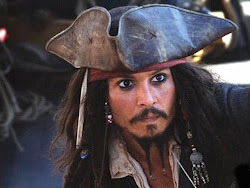 Bootstrap was part of the crew of the Black Pearl during their mutiny against Jack and when they stole the cursed Aztec gold. But he was not in favor of their mutiny so he decides to curse the entire crew for it. He takes a piece of gold and sends it to his son, Will. Will as a child wears this around his neck as his one memory of his father. That is, until Elizabeth steals it and Jack helps lift the curse. As we already know, Will finds himself on the boat thanks to our dear friend Jack Sparrow. For a little while, Will is unsuspecting of his father serving along side him and Bootstrap too has no idea. But a few complications arise when there are two William Turners walking around the deck. The bosun orders: "Secure the mast tackle, Mr. Turner! Step to it!" Who he really means, I have no idea. But both Will and Bootstrap think they are being addressed. So they post leave their current positions to carry out the new task. Bootstrap gets there first, but Will is suddenly angry that someone is doing his job. Will: "Step aside." Bootstrap does not understand what this new guy is doing. Bootstrap: "Hey! Mind yourself! Let go, boy!" Bootstrap then looks up to whoever the abnoxious boy that is disrupting his work is. That's when it hits him. Will on the other hand has no memory of this starfish dude, just looks at him crazily. Probably thinking "why is this guy staring at me creepily?" Bootstrap: "No!" Out of shock and horror that his son has ended up on the same wretched ship as himself, Bootstrap lets go of the rope that is hodling up the cannon. Will tires to save it but it's already falling and Will is pulled across the quarter deck by it. It crashes onto the deck bellow, hits some of the other workers, and causes quite a disturbance. Nobody is very happy about it. And poor Will is blamed for it. Bosun: "Haul that weevil to his feet! Five lashes will remind you to stay on 'em!" Stay on what? Bootstap has other plans though. He tries to black the whip. Bootstrap: "No!" Bosun: "Impeding me in my duties? You'll share the punishment." Bootstrap: "I'll take it all." A selfless pirate? Davy jones decides to stick his nose into the episode, or maybe I should say his tentacles. Jones: "Will you, now? And what would prompt such an act of charity." Jones is a shocked by this kind gesture as I am. Bootstrap just weakly stammers: "My son. He's my son." Jones and Bootstrap look towards Will. Will turns and looks at his father. Family reunion! There's this super awkward yet sentimental. Jones finds it funny and starts to laugh. Jones: "What fortuitous circumstance be this? Five lashes be owed i believe it is." He then hands Bootstrap the whip. That's not barbaric. Bootstrap: "No. No, I won't!" Jones: "That cat's out of the bag, Mr. Turner. (Which one?) You issue will feel its sting be it by the bosun's hand or your own." How about no body gets hurt? Bootstap: "No." Davy Jones glares into Bootstrap's eyes: "Bosun!" Bootstrap: "No!" (5 "no's" in 2 minutes. . . impressive). Bootstrap takes the whip and examines it as intense music plays. And then he whips Will. It's a very joyful scene for Davy Jones who stands and watches contently. What a creep. Don't you have a heart? Oh wait... No. After the event, Will does not seem to have enjoyed his flogging very much. They push him down onto the lower deck and Bosun screams: "You had it easy, boy!" Bootstrap: "Will." Will: "I don't need your help." His voice is raspy suddenly. Bootstrap: "The bosun prides himself on cleaving flesh from bone, with every swing." So that's what he meant by having it easy. Will: "So I'm to understand what you did was an act of compassion?" Bootstrap: "Yes." Well ok then. I guess that's that. What a dramatic family reunion. Will recovers from his anger towards his father and eventually kills Davy Jones to set him free from service. But all that is yet to come!